. He will not get the soldiers to follow him, because he has been opposed to the bonus. MacGuire replied: Yes, but we will have him change. Butler told the Congressional Committee that three weeks later, after this conversation, MacNider changed and turned around for the bonus. So, it seems MacNider was in their pocket. Why was he a top choice and why would he go along with their plot? MacNider, one of Iowas best-known war heroes, projected the image of a down-to-earth Iowa farm boy but he was actually born to bank. 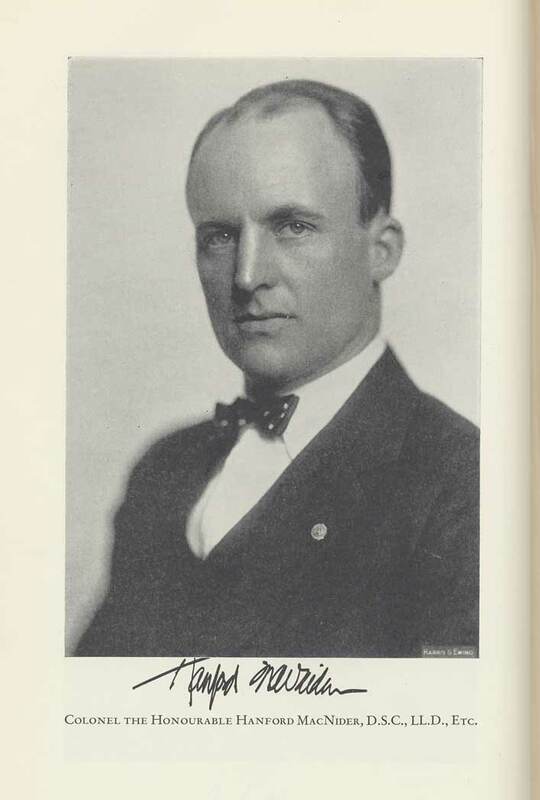 Son of Charles MacNider, a prominent banker and leader in the cement business, Hanford graduated from Harvard in 1911. He then took up bookkeeping in his fathers Mason City bank. In 1912, MacNider became a Master Mason and then rose to the penultimate (32nd) degree, called Sublime Prince of the Royal Secret. Throughout his life, he kept his Masonic ties and his connection to Northwest States Portland Cement, being its president for 53 years. In 1916 and 1917, when U.S. General Pershing was chasing Mexican revolutionary Pancho Villa, MacNider was among 160,000 national guardsmen who patrolled the border. He was soon off to France (1917-1919). The story goes that military charges were laid against MacNider when one of his men disagreed with a Colonel. MacNider then supposedly went AWOL to get to the front. When authorities finally caught up to him, he had already risen through the ranks and won 14 medals, so charges were dropped. While in France, MacNider took part in forming the banker-funded American Legion as a bulwark against radicalism. Upon returning to the U.S., MacNider became the Legions Iowa State Commander (1920-1921) and then its National Commander (1921-1922). In 1924, with his dads money, MacNider created the Republican Service League (a committee of the supposedly non-partisan Legion) and fought to defeat Senator Wildman Brookhart, a Republican renegade who advocated cooperative banking and housing and was denounced by editorialists as that insurgent, Bolshevik, lusty bedouin, buffoon. MacNider was President Calvin Coolidges assistant secretary of war, and Maj. Dwight Eisenhower was MacNiders executive assistant (1925-1928). In 1928, MacNider was considered as a Republican vice presidential candidate. When his father died that year, he took command of family business interests, which thrived during the Depression.
. distinctly a mystic (Diary, June 29, 1937). Kings Minister of Immigration, Frederick Blair, bragged about his efficiency in keeping Jewish refugees, that were fleeing genocide in Germany, from entering Canada. In 1932, MacNider resigned his ambassadorship to Canada and was an unsuccessful Republican vice presidential candidate. In 1940, he failed as a Republican contender for the presidential nomination. He was a member of the America First Committee until December 4, 1941, three days before Pearl Harbour. In WWII, he was promoted to brigadier general (1942) and was a major general upon resigning (1951). The next year, he turned down a request to manage Douglas MacArthurs campaign for the Republican Party presidential nomination. When Eisenhower won the Presidency, MacNider turned down his offer of a cabinet post.